Since I made Veggie Patties at Home with all different kind of vegetables, these days I am almost reluctant to buy veggie burger patties from stores. This time I want to give a twist by adding some protein and complex carbs. The leftover brown rice was the first initiative for this recipe and my love towards Black Bean Fire Roasted pepper patties was the second. 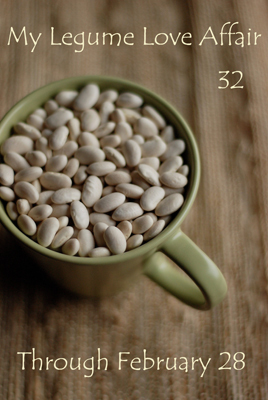 Here is the recipe for you and enjoy! 4. Add Curry Powder, salt, black pepper and paprika. 7. Now add the corn starch and mix and mix it well until it becomes dry. 9. Take the non- stick pan and add oil to it. 10. Cook the patties on two sides until they get roasted. Let them cool make your Yummy sandwich right way or store them in ziplocs and keep them in the freezer for the future use. Once you try and taste this, i am sure you won't to turn into to those store bought patties anymore. I am sending this My Love for Legumes Event at Sandhya's Kitchen, started by Susan at Well Seasoned Cook. 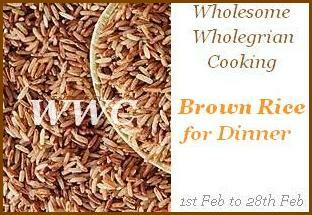 I am also sending this to Wholesome Wholegrain Cooking Brownrice for Dinner Event at Cooking with Siri, started by Sanjeeta at Lite Bite. 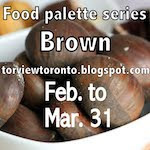 I am also sending this to Food Pallet Series - Brown at TorView Toranto. Healhty and delicious patties..I too make with Kidney beans. wow...looks just awesome and yummy too....do check out my recipes at http://onlyfishrecipes.blogspot.com/ and let me know your valuable comments !